Welo Ana, e ka Hae Hawaiʻi! 2017. Next week Monday up on the hill, go check out the presentation put on by Kamehameha Schools’ Kaʻiwakīloumoku on patriotism and the Hawaiian Flag! It is this symbol which honors you, O Hawaii; it is a mantle for you to have pride in; and above all things, it is the Support for the roof of your house, secured unwaveringly; and it is worthy of pride and boasting. Its awesome beauty as it flutters on the tips of the winds presents Hawaii across the four corners of this globe. This symbol, a Flag, the affection for it is indelibly emblazoned in all peoples; and thus they are proud of and boast of the Flag of their own nation. Abuse of the flag of a nation is the abusing of the nation and its people. Rebellions, quarrels, and wars have been started between nations of this world because of the scorning and mistreatment of the flag of one nation by another. Look at what is happening soon after the overthrow, 1893. THE BEAUTIFUL FLAG OF HAWAII. You may obtain the glorious flag of our land from the hands of the Secretary of the Hawaii Holomua, Mr. Thomas. K. Nakanaela. All those who have aloha for the Independence of the Land, come and get flags for yourself lest they run out. 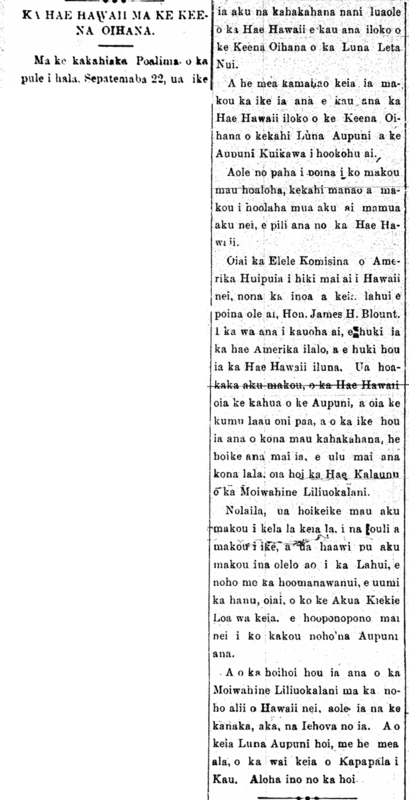 Hawaii Holomua, Buke III, Helu 192, Aoao 2. Aperila 3, 1893. May you wave forever! 1883. Ke Koo o Hawaii, Buke 1, Helu 1, Aoao 1. Augate 15, 1883. The U. S. S. Boston, John L. Stevens, and the Hawaiian flag, 1893. At the request of the Provisional Government of the Hawaiian Islands, I hereby, in the name of the United States of America, assume the protection of the Hawaiian Islands for the protection of life and property, and occupation of the public buildings and Hawaiian soil, so far as may be necessary for the purpose of specified, but not interfering with the administration of public affairs by the Provisional Government. This action is taken pending, and subject to, negotiations at Washington. Envoy Extraordinary and Minister Plenipotentiary of the United States. United States Legation, February 1, 1893. G. C. Wiltse, Captain U. S. N.
The Liberal, Volume I, Number 41, Page 2. February 1, 1893. 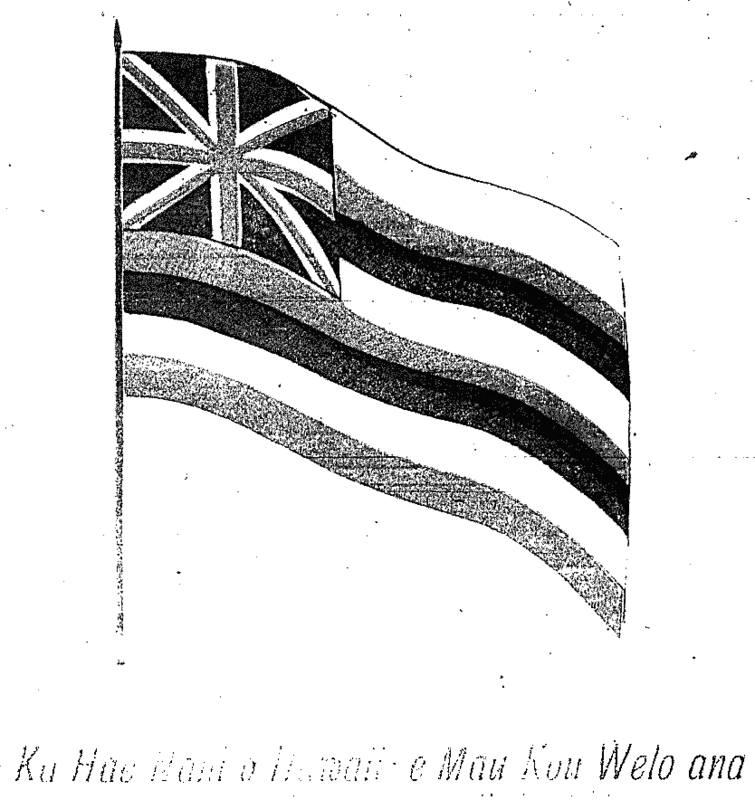 The Hawaiian Flag, an unwavering tree, 1893. THE HAWAIIAN FLAG AT A GOVERNMENT OFFICE. In the morning of Friday last week, September 22, the stripes of the Hawaiian Flag, second in beauty to no other, was seen in the Business Office of the Postmaster General [Luna Leta Nui]. And this is something astonishing for us to see that the Hawaiian Flag is placed in the Office of one of the Heads of Government appointed by the Provisional Government [Aupuni Kuikawa]. Our friends will perhaps not have forgotten the thoughts we published earlier pertaining to the Hawaiian Flag. The Commissioner of the United States came to Hawaii, whose name will never be forgotten by this people, Hon. James H. Blount, When he ordered that the American flag be taken down and the Hawaiian Flag be raised once again. We made it clear that the Hawaiian Flag was the foundation of this Nation, and it is the unwavering tree; and seeing its stripes once more shows us that its branches are growing, that being the Royal Standard of Queen Liliuokalani. Therefore we report to you each and everyday all the signs that we see, and we also give advice to the Lahui, to live with patience, to hold your breath, for it is Almighty God’s time now to make right our Nation’s leadership. The reestablishing of Queen Liliuokalani to the throne of Hawaii nei, that is not something for man to do, but it is for Jehovah. And as for this Government Head, it is as if he is trying to cover up their wrongdoings.¹ How sad. 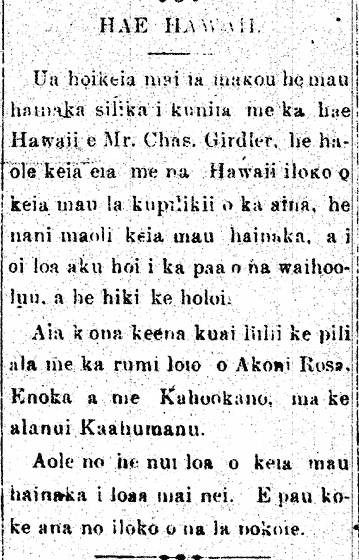 Ka Leo o ka Lahui, Buke II, Helu 776, Aoao 3. Sepatemaba 25, 1893. We were shown some silk handkerchiefs printed with the Hawaiian Flag by Mr. Charles Girdler; this is a haole, who is with the Hawaiians in the difficulties of the land these days; these are truly beautiful handkerchiefs, and because they are dyed color fast, they can be washed. His tiny shop is next to the attorneys’ office of Akoni Rosa, Enoka, and Kahookano, on Kaahumanu Street. They will be gone in a few days. 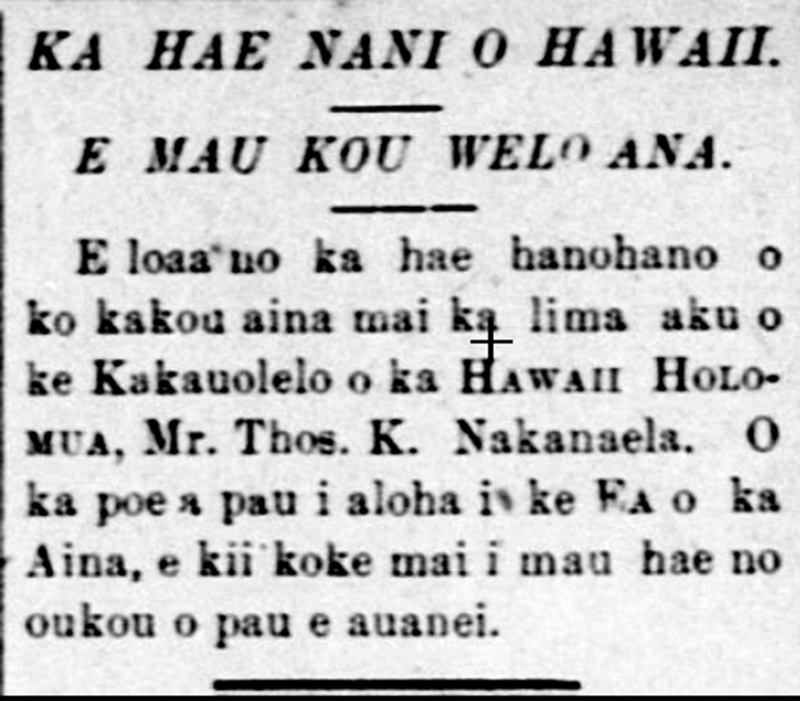 Ka Leo o ka Lahui, Buke II, Helu 731, Aoao 2. Iulai 21, 1893.